From the lining of our nostrils to the sides of our GI tract and on every inch of our skin, bacteria are with us for this ride we call life. By colonizing us, bacteria help us fend off pathogens. If a pathogen reaches our skin, our nose, or our digestive tract, our own microbiome presents such a densely populated environment that the intruder is often unable to survive. When this relationship between us and our microbiome is disrupted (for example, when we take antibiotics), little chinks in our bacterial armor appear, giving an opportunistic bacteria a chance to reproduce. So we should all be thankful for our protective shield of personal bacteria that call us home. Sometimes, bacteria can be helpful even after we get sick. Some strains can be genetically engineered to produce insulin, while others can help make vaccines. Bacteriophages help doctors treat stubborn infections that form biofilms, and some bacteria can even be used to alter vectors of infections, such as mosquitoes. Recently, incredible discoveries have been made in the study of using bacteria against "the emperor of maladies," cancer: Certain bacteria have been shown to destroy tumors in mice, while also stimulating the patient's own immune system to fight the cancer cells. While this research is still preliminary, it reveals an entirely new branch of cancer-fighting treatments that may one day save lives. As we evolved, so did our relationship with our microbiome. One of the benefits we have gained from our commensal bacteria is our ability to break down and use plant food molecules and milk. The bacteria in our gut helps us break down foods - digest them - that we could not otherwise use, providing us with access to nutrients that help us live healthier lives. Other bacteria produce vitamin B that helps with metabolism and vitamin K that helps with blood clotting. One of the things our magnificent microbiome protects us from is bad bacteria that we may eat in the form of contaminated or spoiled food. This is a danger that our ancestors confronted - and transformed into the science of food preservation. Without even knowing they were manipulating bacteria, they found ways to disrupt the harmful bacteria and put the helpful bacteria to work for them. Thousands of years ago, people used bacteria to transform milk, a food that quickly spoiled, into yogurt and cheese that lasted far longer. Bacteria also played a central role in their methods to cure meat, transforming it from a food that could be lethal if spoiled to a food that could survive the winter (and those that ate it could survive, too!) such as pepperoni, salami, country ham, and chorizo. Controlled fermentation with bacteria also helped preserve vegetables, giving us pickles and sauerkraut, as well as fruits, giving us wine. One bacteria in particular gives red wine the characteristic of improving with age. (It looks like everything on your wine and cheese platter is there thanks to bacteria!) Even some beers benefit from bacteria-aided fermentation. Bacteria don't stop at just preserving foods, it turns out they can help preserve the Earth itself. Since they first emerged on our young planet, bacteria have been essential in breaking down materials, giving us an atmosphere we can breathe, soil with nutrients for plants, and oceans teeming with life. As if that were not enough, bacteria are now helping humanity restore some of the pristine ecology damaged by civilization. Certain bacteria help us break down toxic materials and plastic before dumping (bioaugmentation), while others can help clean up oil spills (bioremediation). There are even bacteria that can render radioactive material neutral! Bacteria are also used to detect toxic waste, grow nanowires, and produce a huge range of biofuels. 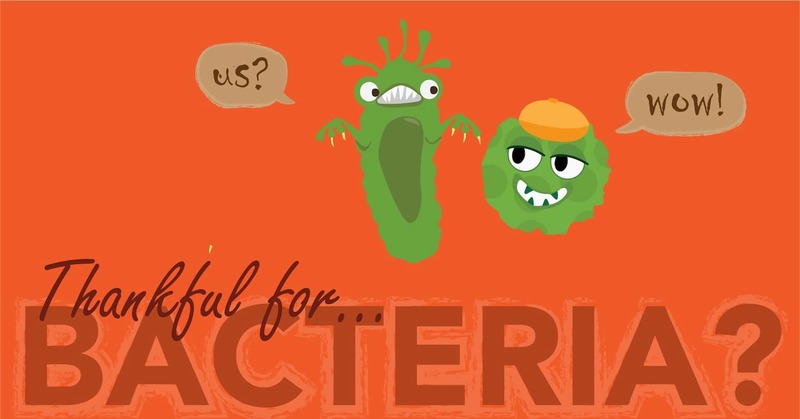 Bacteria just keep giving back! With their small genomes, frequent mutations and fast reproduction, bacteria are the perfect organisms to study genetics. Bacteria have played a central role in a vast number of breakthrough genetic studies; E. coli alone has been the focus of 12 individual Nobel Prize discoveries, and not discoveries limited to bacteria but rather to life itself: DNA replication, gene activation, DNA splicing, genetically engineered DNA, ATP (the molecule that powers life), protein synthesis, and DNA repair mechanisms. Bacteria also play a starring role in the newly developed method of splicing and repairing human DNA called CRISPR Cas9, a technology that could one day repair dozens of genetically-related diseases. This Thanksgiving, let's all take a few minutes to imagine the world without bacteria. If you consider the role these organisms played in the development of oxygen-breathing life on our planet, their role in helping our earliest ancestors store food for survival, and their significance to contemporary medical science, we can safely say that we wouldn't be here but for these humble one-celled organisms. Thanks, bacteria!